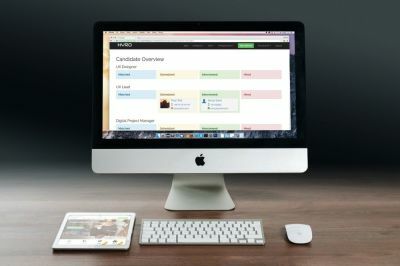 Hyro is an algorithm-based recruitment and networking platform that matches company's needs with the skills, salary requirements and personality of our +1,700 digital candidates. Companies gets access to the matched candidates profile resumé, a link to their CV as well as an assessment report on culture and personality match. Candidates can create a profile and see which jobs they match best with, and self-match. Every step inside Hyro creates notifications, so all parties are always aware of where they stand. 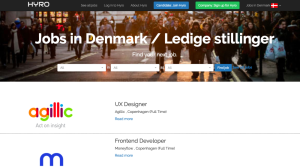 Tap in to the growing database of 1700+ candidates in Denmark. Hyro has many great candidates ready to be contacted and invited for an interview, when they match your companys culture, personality and desired skills and experience. Join Hyro as a company and set your information and culture. 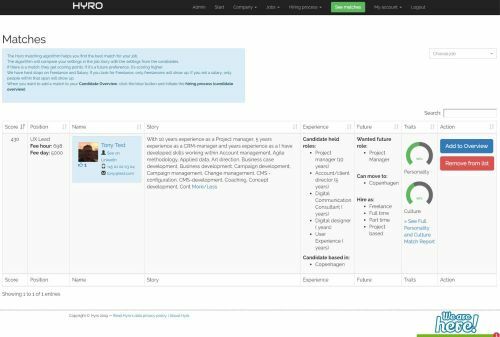 Once you have created a job story you can see all the great matches and add them to your overview and start the recruitment process. You can also schedule interviews and view their profile. The big difference with Hyro is that we care about your aspirations. Our matching algorithms gives a high weight to your future wants and preferences, rather than just matches you with what you already are doing. This opens up for new, inspiring and especially motivating job matches that you may not have thought about. We are excited to put you forward for new opportunities that matches your skills and preferences. You select which kind of culture you want to work in, as well as which kind of personality you have. This helps the matching to be much better. After all, you are choosing your next job as much as the company is choosing you.